I want to run my java programs in my Windows PC and for that I need to set the environment variables to the specific path, How to do it? Can you tell me the procedure to do it? What are environmental variables in windows OS? How one can change these environmental variables? How to assign DVD drive as my 1st boot device? 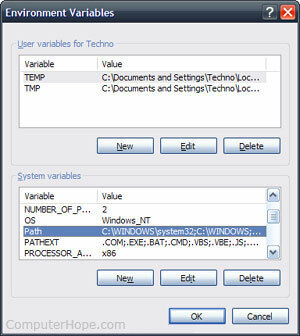 Re: How to set Environment variables in my Windows PC? Can you tell me the procedure to do it? STEP 2: Go to Advanced tab and select the button Environment variables. STEP 3: Now you will see two set of lists that is User variables for your user account and system variables. So if you need the environment variable to be visible only for your account then select the variable PATH from the list and double click it. STEP 4: Now if you see already some destination is set in the variable value field then simply press End key ( go to the end of line ) and type ; (semicolon) and paste the jdk file path (eg.C:\Program Files (x86)\Java\jdk1.6.0_01\bin) and press Ok. STEP 5: Repeat Step 3 & 4 if you want to set the environment variable as System variables. Now you can run your java programs without any problem. 2. If you see Advanced or Environment, click those. 3. There are two windows on this panel: System variables and User variables. Check whether you have a Set button or a New button. *Do not click the Set button. *Click on ANY item in the User variables list. The Variable and Value fields are then filled in with whatever item you clicked. *Replace the expression in the Variable field with the single word PATH. Click both Set and Apply, in that order. Now replace the expression in the Variable field with the single word CLASSPATH. *In the Name field, type PATH. *Click OK to complete that variable. *Click in the User variables window. *Exit all windows and programs, especially any command prompt window. do not, restart your computer and try the java and javac commands again. I thing your Java Path will be configured. The path is now managed by Windows 2000 and Windows XP and not the autoexec.bat or autoexec.nt files as was done with earlier versions of Windows. To change the system environment variables, follow the below steps. Right-click on "My Computer" to select Properties. Click the "Environment Variable" button. Scroll down the "System variables" list to the "Path" variable. Click "OK" to close the System Properties window. Click Run... for a Run window. Type "cmd" in the Open: field. Type a command such as "csc"
1.Right-click on the MY COMPUTER,and then Click PROPERTIES. -->Click NEW to add a new variable. -->Click an Existing variable,and then click EDIT to change its name or value. -->Click an Existing variable,and then click DELETE to remove it. First of all go and start your computer and then Right click on the My computer and then just select the properties option and click on it...After that click on the advanced tab and then click on the Environment Variables..Now here you can do any changes like delete ,edit or add a new variables...If you want to create a new variable then click on the add a new variable..And then click an existing variable,and then click EDIT to change its name or value ..Now at the end just click on the existing variable,and then click DELETE to remove it.